A fence is not just a structure that borders your home. It’s an element that gives your home character and personality. If you are looking for a suitable upgrade, consider these fencing renovations. The aesthetics of your fence helps you create warmth for your property’s exterior. There are so many styles and color patterns for fencing. Traditional wood fences, for instance, provide a welcoming vibe and you can choose from so many wood species. Wood fencing also offers several key attributes, one of which is its affordability. Whether a picket breaks or a post starts to rot, replacing these structures is cost-effective. Wood materials are also readily available when you get help from an Orange County fence company. Another option you might consider, if you are strictly focused on aesthetics, is vinyl fencing. Often featuring a white color, this type of fencing lends itself well to a striking appearance. It’s also more hardwearing than wood, and is proficient at holding up in extreme environments. That’s why it is used by many who live near the beach or ocean. The function of your fence is another key factor that determines what type of materials you use throughout this project. If you are looking for something that looks modern and built to last, metal fencing might be the right option. 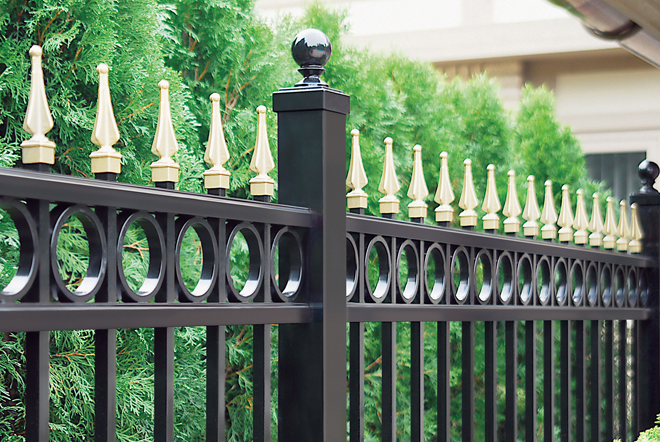 Made from and iron alloy, metal fencing often features a powder-coat finish. This makes it virtually indestructible, which means it is capable of resisting rust and chipping over the years. Metal fencing is also beautiful, and comes in many styles. Chain link fences are cost-effective and durable. They come in many heights and colors, and you can even get them galvanized so that burrs and sharp surfaces are eliminated. This is something to stay cognizant of if you have a family with small children running around. The next time you’re looking at your home, consider enhancing its curb appeal with the addition of a new fence. Metal fences are durable and give you an extra sense of security, while vinyl fencing around Orange County and wood fences offer natural beauty. Contemplate what style you want to create a truly one-of-a-kind look for your property.